The Swindon Guggenheim. I like this one a lot, and fits into the 'Seven wonders of Swindon' idea I have been kicking around. This helical ramp is in Swindon, and as can be seen from the 'before and after' pictures above, much needed to be done before the picture could be released as a full image from the Nextian Universe. Firstly, the cars in Thursday's world are generally old American cars of the forties and fifties and sixties; the car speeding through (using Adobe motion blur) is a Tucker Torpedo, a highly advanced car built in the fifties whose sales were crushed, so it is claimed, by large automobile corporations in the US. The car in the distance is a Hudson Hornet, my favourite US car design along with the Studebaker. If anyone knows of one languishing unloved in a garage, please call me. The posters in the background all relate to items mentioned in the Thursday books. 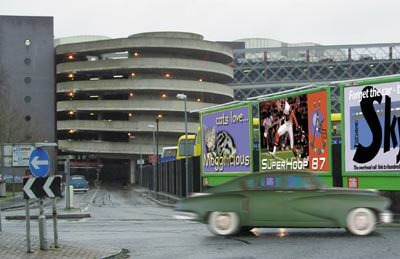 'Moggilicious' featuring Rolo, my daughter's dopey silver tabby cat, the 'Superhoop '87' from the end of book 4, Something Rotten, and the Skyrail, from TN2. One thing I didn't do: The headlights are still shining from a car that doesn't exist! 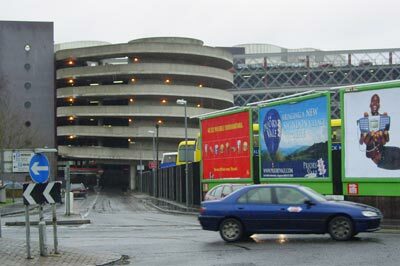 "Swindon's famous 'Spiral' stressed concrete multistorey car ramp (1928) was used by Frank Lloyd Wright as inspiration for his clearly inferior Guggenheim Museum in New York. The ingenious double-helix design is configured so the 'up-ramp' and 'down-ramp' never converge ."